Philadelphia Eagles' Nate Gerry celebrates after the NFL Super Bowl 52 football game against the New England Patriots Sunday, Feb. 4, 2018, in Minneapolis. The Eagles won 41-33. 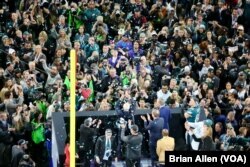 The underdog Philadelphia Eagles defeated the New England Patriots 41-33 in Minneapolis, Minnesota to win the 52nd edition of the U.S. National Football League's annual Super Bowl championship. The win gave the Eagles, representing the National Football Conference, their first-ever Super Bowl trophy after two previous appearances. Eagles quarterback Nick Foles, who was a backup this season until star quarterback Carson Wentz suffered a season-ending knee injury in week 14, was named the game's Most Valuable Player, throwing for three touchdowns and 341 meters, including a touchdown pass to receiver Zach Ertz late in the fourth quarter that gave the Eagles the lead for good. 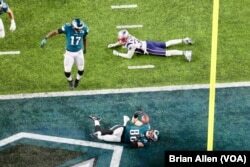 Foles even caught a touchdown pass on a trick play in the second quarter, making him the first player in Super Bowl history to both throw for and catch a touchdown in the same game. 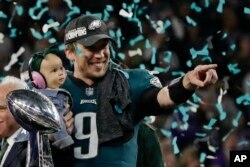 Philadelphia Eagles quarterback Nick Foles (9) holds his daughter, Lily James, after winning the NFL Super Bowl 52 football game against the New England Patriots, Sunday, Feb. 4, 2018, in Minneapolis. The Eagles won 41-33. 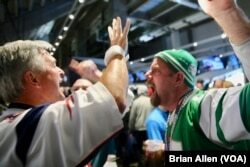 The Eagles lost the 1981 Super Bowl to the Oakland Raiders and the 2005 game to New England. The franchise's last NFL championship came in 1960 -- seven years before the first Super Bowl game. The Patriots, guided by future Hall-of-Fame head coach Bill Belichick and future Hall-of-Fame quarterback Tom Brady, were seeking their second consecutive Vince Lombardi trophy and their sixth overall in Brady's 16 seasons with New England. The 40-year-old Brady, a three-time Super Bowl MVP, shredded Philadelphia's defensive secondary for a playoff record 462 meters and three touchdowns, and was poised to lead New England on another game-winning drive after the Eagles's final touchdown. But Eagles defensive end Brandon Graham stripped Brady of the ball and teammate Derek Barnett recovered it. The game saw a record 1,052 meters of offense by both teams. After Philadelphia rookie place-kicker Jake Elliot hit a 46-yard field goal to put the Eagles ahead 41-33 with just over a minute left in regulation, Brady stepped on the field for one last drive to potentially send the game into overtime. But a final deep pass to the end zone fell incomplete as time ran out. ​Brady says he plans to return next year to try for a seventh title. Foles will likely return to a backup role under Wentz, one of the game's rising stars.